Make it more efficient and extend its life by doing regular maintenance! When you clean your house, you clean all the rooms, wash the entire bathroom and wash your appliances. But you probably do not think about washing the inside of your dishwasher too. And yet, this is a cleaning that should be done regularly. Even if this appliance is used to wash other things, it is necessary to wash it from time to time. And not only will these cleanings make it more efficient, they will also extend the life of your device. And you will be so surprised to see the difference after washing your dishwasher: your dishes will be impeccable! Because over time, it accumulates a whole bunch of food residues in the filter at the bottom of the device. Jillee from One Good Thing explains the 3 simple steps to deeply clean a dishwasher. 1) Take the bottom basket out and make sure the bottom of the dishwasher and the filter are fully cleaned of all food residue. The bottom of the dishwasher must be impeccable. 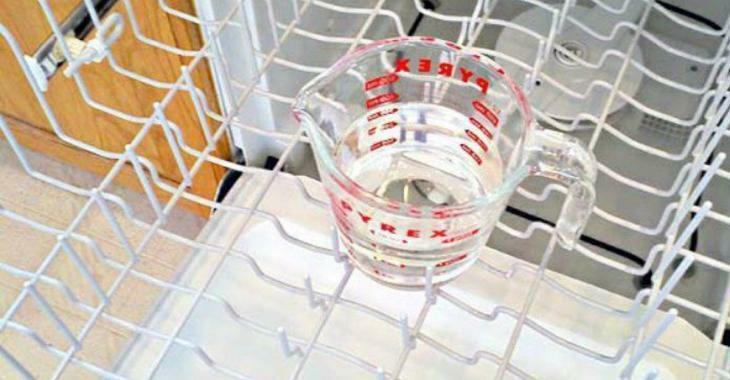 2) Place a measuring cup filled with white vinegar in the center of the top rack of the dishwasher. Then start a normal cycle to the highest temperature. 3) Once this cycle is complete, put back the bottom basket and sprinkle baking soda all over the bottom of the dishwasher. Then start another cycle, always at the highest temperature.